by the time the storm moves on. Sometimes he is "all under" and it looks like a lump of afghans on the sofa! She has to keep watch over house and garden! The dogs, however, will be at my feet. For dogs deserve a tea treat as much as I! It's Wednesday at I'm sharing our snowy winter day with Susan at A Southern Daydreamer for Outdoor Wednesday. I am L O V I N' the SNOW here on our side of the Prairie this morning, too, dear friend!!! Unfortunately, I've had some "extra" laundry as we found where a mouse had been in the lower level storage cabinet...what a mess...not to mention the "health hazard"!!! A Pork Loin is cooking away in the Crock Pot and "Mr. Ed" completing another "project" in Studio One!!! Perhaps I can join him a bit this afternoon, unless like Doggie, I decide a nap is in order!!! 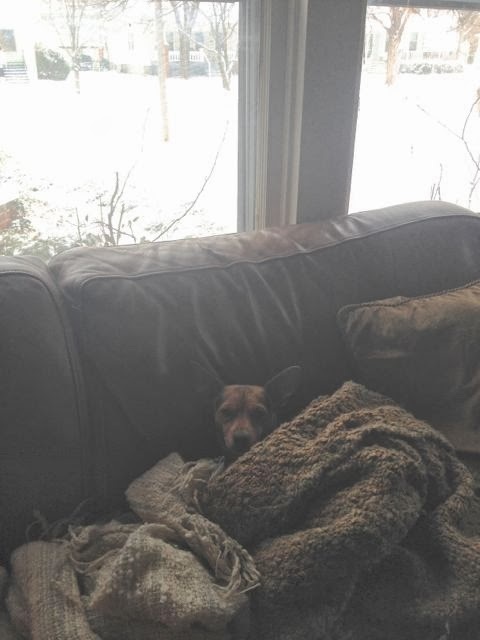 Our Oliver is an "under cover" dog. Sometimes I don't know how he breaths!! Your snow might be the snow we're waiting on. Already flights are being cancelled at Midway and O'Hare and the first flake hasn't fallen. I like your plan for a snow day. You have a lovely blog. Your dog is so cute inside the afghan. I have to be super careful about sitting down due to cats being under blankets etc.! 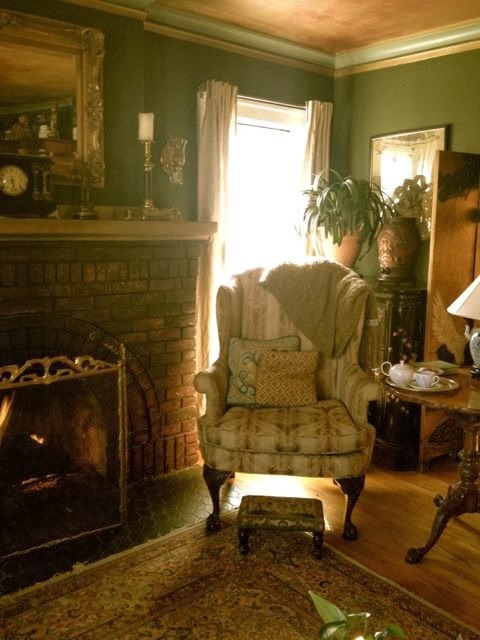 Tea time looks wonderful by the fire. Funny the contrast on what the two dogs do on a snow day. People are the same. 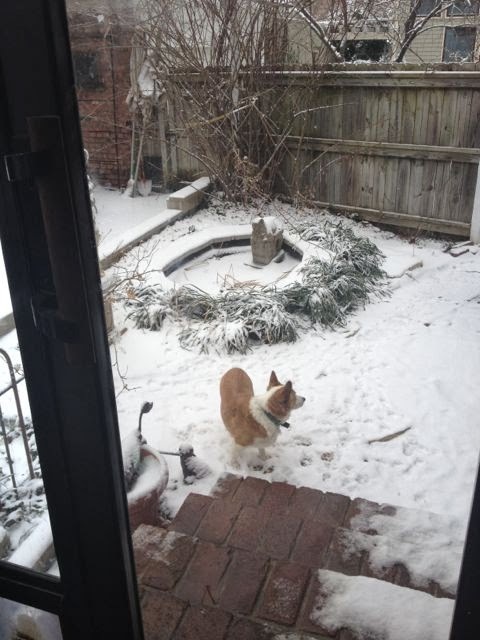 Tuck in or go out and frolic in the snow! Looks much the same here. Stay warm!!! Stay warm and cosy, Martha! I hope you have a fire going! Love your cozy photos...Have you been reading any good books? I love to read about your teas and homecaring! Today is definately the day to stay home curl up with a good book, bake or roast something and enjoy just being home. Girl I am so with you, I am not going out of the house today. I am so over the pretty snow thing by now. LOL! Stay warm and safe. Calling by from Outdoor Wednesday as another participant, I think snow days are better than rain days which we are getting constantly battered by here in the UK this year!